Just 15 days before Britain is due to leave the European Union, May is using the threat of a long delay to push Brexit supporters in her Conservative Party finally to back her deal. A new vote on her deal is likely next week, when those lawmakers will have to decide whether to back a deal they feel does not offer a clean break from the EU, or accept that Brexit could be watered down or even thwarted by a lengthy delay. Earlier, lawmakers voted by 334 to 85 against a second referendum on EU membership. Most opposition Labour lawmakers did not back the measure and even campaigners for a so-called People’s Vote said the time was not yet right for Parliament to vote on the matter. The government narrowly survived an attempt to give lawmakers control of the parliamentary agenda on March 20 with the aim of forcing a discussion of alternative Brexit options at a later date. May’s authority hit an all-time low this week after a series of humiliating parliamentary defeats and rebellions. But she has made clear her plan is still on the agenda, despite twice being rejected by an overwhelming majority in Parliament, in January and again this past Tuesday. 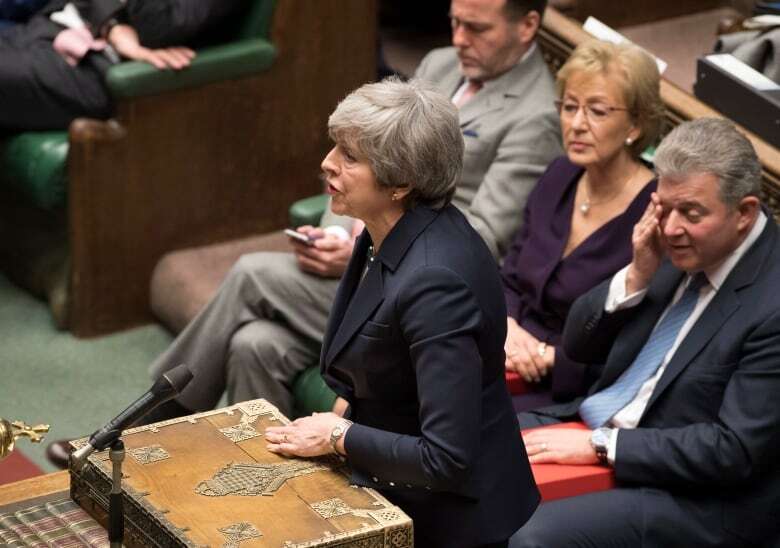 Seeking to win over dissenters, she has given rebellious Conservative lawmakers a thinly veiled warning that a failure to back her plan could mean no Brexit at all. 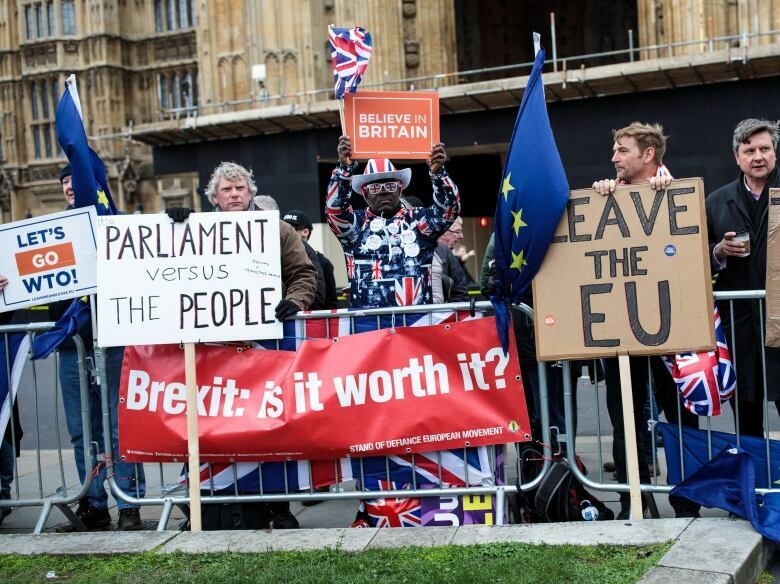 Britons voted by 52 to 48 per cent in a 2016 referendum to leave the EU, a decision that has not only divided the main political parties but also exposed deep rifts in British society. Sterling has swung more wildly this week than at any point since 2017, rising to a nine-month high as investors bet Britain would avoid a no-deal Brexit. British finance minister Philip Hammond said Brussels might insist on a long delay to Brexit if the U.K. government requests an extension to the process. “This is not in our control and the European Union is signalling that only if we have a deal is it likely to be willing to grant a short technical extension to get the legislation through,” Hammond told Sky News. “If we don’t have a deal, and if we’re still discussing among ourselves what is the right way to go forward, then it’s quite possible that the EU may insist on a significantly longer period,” he said. May said on Wednesday lawmakers would need to agree a way forward before an extension could be obtained. All 27 other EU member states must agree to any extension. She said her preference was for a short delay, meaning the government could try to pass the deal she negotiated with the EU by the middle of next week, even though it was rejected heavily by lawmakers in January and again on Tuesday. Andrew Bridgen, a eurosceptic lawmaker from May’s Conservative Party accused her of pursuing a “scorched earth” policy of destroying all other Brexit options to leave lawmakers with a choice between her deal and a delay of a year or more.